Razer, the world’s leading high-end precision gaming brand, takes your thumping music beats and exciting game audio to thestreets with the Razer Electra slick headphones designed to deliver powerful bass depth and crisp clear soundstages in a comfortable and versatile package. Whether gamers are flinging birds, pwning monsters, or running gauntlets on their smartphones, tablets, or netbooks, the demand for enriching gaming experiences with exceptional audio is undeniable. The Razer Electra provides just that with deep, booming bass and balanced sound delivered by audio drivers finely tuned to low frequencies. While out on the streets or in the subway, noise can be a major hindrance to your listening pleasure. Enter the Razer Electra, featuring optimally positioned ear cups and thick leatherette ear cushions that mold to the shape of your ears to block out the bad stuff and keep the good vibrations in. 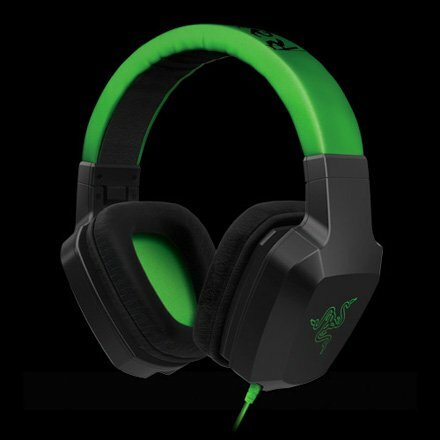 Also built with a flexible headband structure and lightweight frame to provide long-lasting comfort over extended play, the Razer Electra keeps the awesome soundtrack to your life pumping full force. Electrify your life through the power of sound with the Razer Electra. Slick headphones built to deliver exciting gaming audio and music, the Razer Electra allows you to hit the streets with sick bass drop and a balanced sound thanks to finely tuned drivers in each ear cup. Enjoy the music and forget the noise as the Razer Electra was designed with optimally positioned ear cups and thick leatherette ear cushions that mold to the shape of your ears for enhanced sound isolation. With a flexible headband structure and lightweight frame, you’re assured of long-lasting comfort over extended play. Kick your audio on-the-go up a notch, with the Razer Electra.